It can be tough to be the first-born kid in a family. The first child forfeits center stage when a sibling is born, is expected to be the good role model, and forges the path as he conquers kindergarten, homework, date night, driving lessons, prom, college, and all the other fear-inducing milestones of growing up. Now it seems the first-born male child may be more prone to disease later in life than his younger siblings. This news comes from a study conducted at the University of Aukland in New Zealand which compared 50 first-born sons of middle age to their second-born younger brothers. The 50 first-borns were all overweight and between the ages of 40 and 50. The BMI measures a person’s weight against height to determine healthy weight. The higher a person’s BMI, the more likely they are to be overweight or obese and prone to hypertension, metabolic syndrome, diabetes, and heart disease. A high insulin sensitivity is desirable and indicates the body’s healthy response to insulin in the bloodstream. A low insulin sensitivity level increases the risk of diabetes. How did the brothers compare? Height between brothers was similar throughout the study group. Older brothers were, on average, 15 pounds heavier than their younger brothers. The average BMI of older brothers was 29 but only 27.5 for their younger brothers. The older brothers level of insulin sensitivity was an average of 33% lower than that of their younger brothers. The research team suggests its findings could signal long-term health risks with being born first although larger studies are needed for confirmation. All the men in the study were overweight city-dwellers so there’s presently no way to determine if the findings carry through to a broader population. 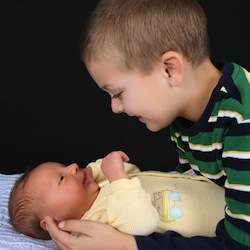 The findings do, however, strengthen findings from previous studies that indicate birth order’s influence on body composition and metabolism during childhood. These studies indicate that first-borns weigh less at birth but soon catch up; during young adulthood, they tend to measure for reduced insulin sensitivity, higher cholesterol levels, and elevated daytime blood pressure. The New Zealand team suggests blood flow to the placenta may be the mechanism that influences first-borns this way. The blood vessels in the uterine lining undergo structural changes during a first pregnancy that remain intact when the pregnancy ends. These lasting structural changes may provide more abundant blood flow to the fetus during subsequent pregnancies. Source: Albert, Benjamin B., et al. “Among overweight middle-aged men, first-borns have lower insulin sensitivity than second-borns.” Scientific Reports. Nature Publishing Group / Macmillan Publishers Limited. Feb 6, 2014. Web. Feb 12, 2014.